The Red Hawks outscored and outplayed the Red Arrows in their first win against them since 1981. Photo by Kelly and Rob Lalone. 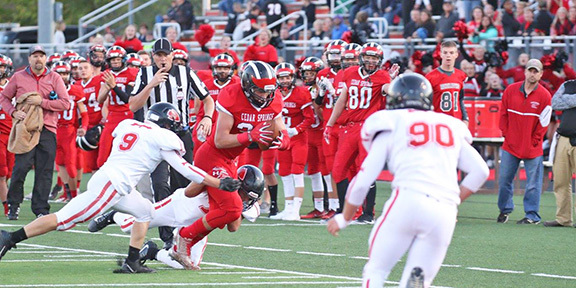 On Friday, September 28, the Cedar Springs varsity football team brought in a 28-14 win against the Red Arrows of Lowell at their homecoming game in Red Hawk stadium. The Hawks made history after beating Lowell for the first time since 1981. Varsity coach August Kapolka included the “12th man,” or the support of the Cedar Springs student section and community, in his team’s success. Junior halfback Ryan Ringler started the scoring off with the first touchdown of the night, with 3:08 left to play in the first quarter. Ringler went on to run in a two-point conversion. The Red Arrows came back shortly after and scored their team’s first touchdown of the night at the tail end of the first quarter, with 36 seconds left to play. In the second quarter, varsity Red Hawks John Jacob Todd and Ryan Ringler went on to score additional touchdowns, while their defensive line kept the Red Arrows from completing any runs into the end zone. At halftime, senior varsity football player Nathan Patin and his girlfriend senior Nicole Mosher were crowned homecoming king and queen for 2017. Returning from halftime, neither team made any advances in the third quarter, starting off the fourth with a standing score of Cedar Springs 22, Lowell 8. In the final quarter of this year’s homecoming game, both teams scored a total of 6 points each. Lowell varsity player David Kruse scored on a one-yard up the middle into the end zone. Ringler upped the total for the Red Hawks with a 67-yard run through a clear center field, his speed giving him a major advantage. To support your Red Hawks, come out to the stadium of Forest Hills Northern on Friday, Oct. 6, at 7 p.m. and cheer them on as your Hawks look to continuing to make history.